Barcelona, Madrid, Paris, Amsterdam, Tokyo and Florianópolis, in Brazil, are some of the places where designers Xavier Zazo and Clara Brull have paraded their avant-garde women’s fashion collections, Zazo & Brull. 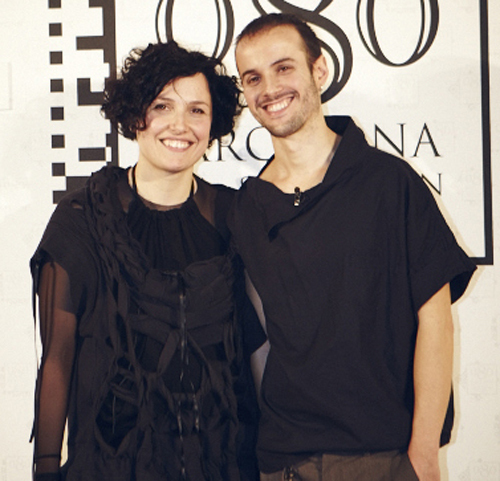 At the onset of the new millenium, Zazo and Brull began an intense professional journey that has taken them to prestigious runways such as Gaudí, the SIMM Hall of Madrid or the International Fashion Fair in Tokyo, as well as to international fairs such as Bread & Butter, Rendez-vous in Paris, Modefabriek in Amsterdam, and MQ in Vienna. Furthermore, their creations have featured at 080 Barcelona, in Valencia Fashion Week, and the designers have been invited to participate in the Pasarela Gaudí Novias, in the Bolivia Fashion gala in the city of Santa Cruz, and SUL Fashion Week in Brazil. Xavier and Clara work in tandem to experiment with volums and the contrast between delicate and heavy fabrics. Their collections are characterized by production entirely in Spanish workshops, produced with meticulous attention to detail. Thanks to their vivid imaginations, in every collection they recreate their particular vision of romanticism, using colours across the spectrum. In their 15 years of constant creation, they have not only focused their work on the catwalk; their determination to showcase their garments has led to collaborations in other artistic endeavours, such as in editions of The Genre Project in Espai Ample Barcelona, or the exhibition of their collection A/W 10-11 Frágil in the creativity center Arts Santa Monica in Barcelona. They have also collaborated with artists such as Alicia Framis in her exhibition ‘Wouldn’t it be nice …’ in the Centre of Contemporary Art, Genoa, and the exhibition ‘From China with love’ in the Ante Gelink Gallery Amsterdam, and with artist Björn Tagemose. Their work has been noticed by major international fashion magazines and showcased in numerous features: Vogue UK, editorial photographed by Mario Testino, GAP Press, Collezioni, Italy Glamour, Vogue France, Brazil and Spain, Elle Serbia, l’Officiel Paris, Collections, Surface, Stilomag, On design, Sport & Street, ID, Fashion Windows, Neo2, Stylesight, Tenmag, bmm, Avenue, Miniguide Russia, Jewel Magazine, Qvest, Global Blue, WGSN and in daily newspapers such as La Vanguardia, El Periódico, El Mundo, ABC, La Razón, El País, el Punt Avui and Ara, among others. In the third annual international competition ‘El Botón’ – Mango Fashion Awards – Zazo & Brull were chosen from 10 finalists and were the only Spanish representatives. Zazo & Brull designs are available for purchase in several fashion outlets, as well as through their own online store.